1871 Map of Manhattan Police Departments. Map of the County of New York, Showing the Wards and Police Precincts, And Location of Station Houses. This is large map 1871 map of New York City's Wards and Police Precincts. 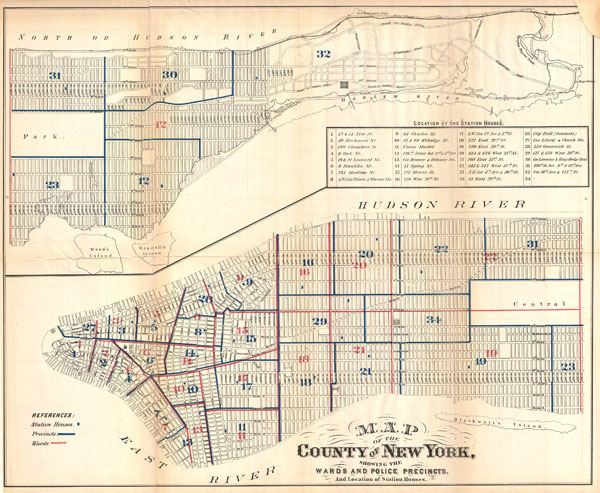 Covering all of Manhattan in two sections, this map details the locations of Police Departments, Station Houses, Wards, and Precincts – many of these Police Departments maintain the same locations today. When Hardy issued this map there were 32 Police Precincts in Manhattan. All streets are labeled. Published by John Hardy, Clerk of the Common Council, for the 1871 edition of the Manual of the Corporation of New York. Very good. Minor discolorations along and verso reinforcement original fold lines. Repair of minor loss, upper right corner - see zoom. Haskel, D. C., Manhattan Maps, A Co-operative List, 1224-1225.